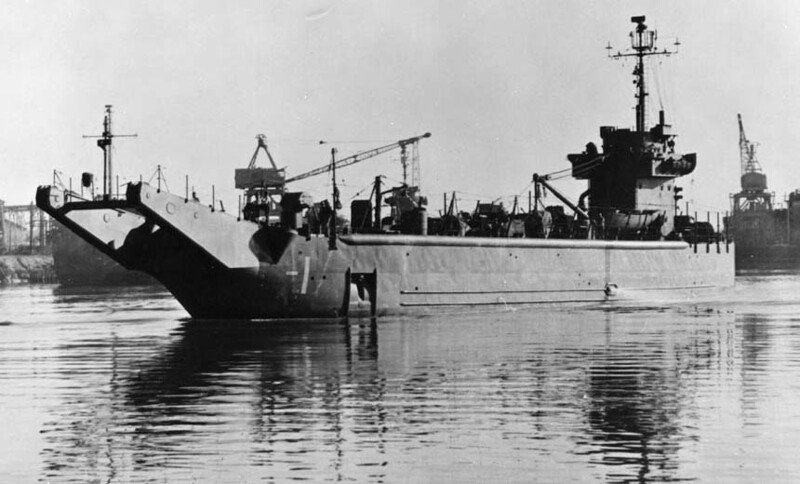 Originally designated LSM-549, she was launched by Brown Shipbuilding company, Houston, Texas, 7 December 1945, and commissioned 18 March 1946 at Houston, Texas, Lieutenant Commander C.S. Horner in command. Gypsy completed her shakedown training 20 March 1946, and sailed ten days later from Norfolk for San Pedro, California, where she arrived 26 May. The ship then departed 14 June to take part in the impending Operation "Crossroads," a historic series of atomic tests. Arriving off the atoll 10 July 1946, Gypsy witnessed the Baker Test 25 July and assisted in recovering beached and damaged craft and doing underwater work on test ships, as the Navy developed a large amount of valuable scientific information on the effects of the atomic bomb on ships and how to reduce them. Departing 16 September 1946, Gypsy worked on the raising of SS Britain Victory at Honolulu until 8 November. She arrived San Pedro 10 December 1946 for extensive repairs until June 1947, then did limited salvage work before proceeding to Guam, arriving 18 August 1947. There Gypsy salvaged and towed to Guam the former bow of cruiser Pittsburgh, lost in the great typhoon of June 1945. she returned to San Diego 17 January 1948, decommissioned 21 January and joined San Diego Group, Pacific Reserve Fleet. Gypsy recommisioned 8 August 1951, and after shakedown and repairs arrived Pearl Harbor 19 October 1951. For the next 7 months the ship operated in Apra Harbor, Guam, relocating mooring buoys and working on the breakwater. Arriving Pearl Harbor 31 May 1952, Gypsy had new salvage equipment and electronic gear installed and sailed 15 September for Subic Bay. Arriving 9 October she began removing a sunken Japanese hulk. She sailed 9 January 1953 for Inchon, Korea, site of one of the decisive amphibious operations in history. There Gypsy removed a sunken barge from the harbor. Later she worked off Pohand and helped clear explosives from the Ulsan Harbor. Korean coastal work was completed 6 May 1953, and the ship sailed for Pearl Harbor, via Yokosuka and Midway Island, arriving 5 June. After operations there, Gypsy sailed to Eniwetok and upon her arrival 18 September began renewing and positioning fleet moorings for the coming Atomic bomb tests, Operation "Castle." She arrived Bikini 7 February 1954 and witnessed the first test shot, the second thermonuclear explosion in history, 1 March 1954. She assisted in recovering test equipment, was detached 26 March 1954, returned to Pearl Harbor 18 April. After operations there, she sailed to Long Beach, arriving 4 May 1955 for deactivation. Gypsy commissioned 23 December 1955 at Astoria Oregon, and was placed in reserve. She was stricken from the Navy list in 1973 and sold for scrap.